Think early engines were quaint and old fashioned? Think again. We often imagine early locomotives of the transcontinental railroad as little more than primitive teakettles, as colorful as they were useless. True, they did not have all the modern luxuries such as a water glass to determine water levels in the boiler, or the all important air brake, but neither did anyone else. Crews were skilled, brakemen plentiful, and everyone knew to jump, just in case. But if we look further, we find that the iron horses of 1869 were impressively modern and well-built machines, fully capable of their work. The age of experimentation was long past, and engines were enjoying a growing maturity of design and principle. And in building new, the first transcontinental railroad had the very best of them. The first transcontinental was a massive undertaking. It required powerful, capable engines, and it needed them in massive numbers. Power was everything. When the road was completed in early 1869, the Central Pacific and Union Pacific averaged one hundred and fifty engines each on their rosters, placing them among the top ranks of important locomotive operations in America. Nearly all these engines were new. Building new allowed the line to avoid the albatross of inherited fleets of idiosyncratic old engines. It could start fresh. And by the spring of 1869 the vast majority of these engines were the latest thing out, and most of them were less than three years old. They were true filly in every sense of the word. A few engines - around a dozen or so - had been acquired second hand as opportunity allowed, but even here, most were only a few years old and a several were still in their original packing crates. The majority of locomotives on both roads were standard American 4-4-0s. The “eight wheeler” had long proved itself, and the CP and UP examples were built by established manufacturers to stable, rational designs. Both roads also championed the impressively modern 4-6-0 or "ten wheel” type, which combined the strength of an ox team with the trotting capacity of a road engine. The Central Pacific got its first 4-6-0, the mighty Conness, in 1864 and the Union Pacific followed not long after. By late 1868, the UP was even purchasing 2-8-0 freight locomotives from Baldwin, which had built the first of the type, the impressive red-and-plum Consolidation, just over two years earlier. The Central Pacific tended to be the more mechanically conservative of the two companies. It preferred proven designs, tried and true, built by established manufacturers, with little experimentation to go wrong. This was sound thinking. The CP was at the farthest end of a supply chain, and all its engines required months at sea for delivery. It had no time to take risks or make experiments - it was all about practical working power. The Central Pacific management never quite figured out what to do with its moguls, but embraced the ten wheeler with fervor. The Union Pacific was more progressive with locomotive design, and connected by rail to its locomotive builders. Engine delivery was only a few weeks away. 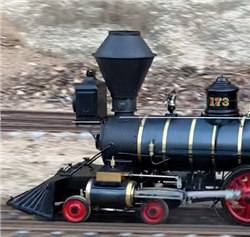 Things really started jumping from 1866 on, when Its mechanical department, under Isaac Congdon, became actively involved with every part of the locomotive, and made extensive drawings and specifications for its builders to follow. More pressing on the Union Pacific’s motive power desk was how to use coal reserves alongside its line, and how to keep its engine boilers full of water at all times, especially for machines standing still while in construction service. As the Union Pacific built its line towards western coal reserves (and conversely ever farther from cordwood supplies), efficient coal burning engines became a major priority. Coal burning fireboxes, with arches to increase heat transfer, had been developed a few years earlier, and by 1867 were reasonably efficient and dependable. With this change, the elegant new diamond stack, specifically designed for coal burning locomotives, appeared on the prairies, giving Union Pacific engines a smart and rakish appearance, even on the far stretches of the mountain west. 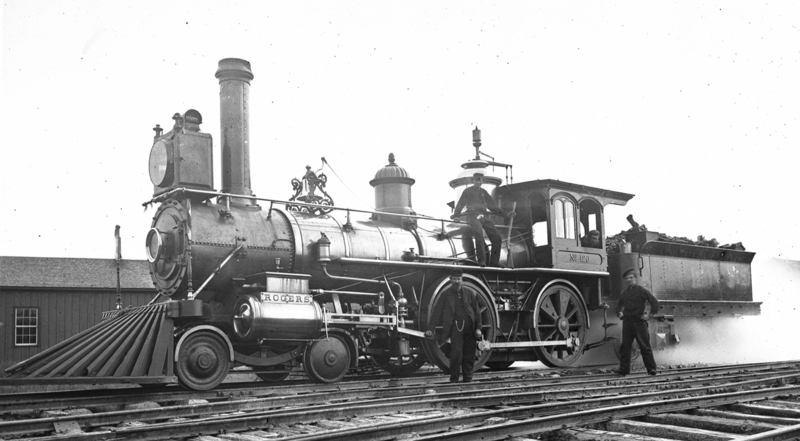 A more significant development came by 1868, as the UP adopted the “extension front,” or extended smokebox. Union Pacific’s No. 119 is the best known of the extension front engines, which contained spark netting within the smokebox shell instead of upon the stack. This allowed elegant straight stacks, raising upwards of six feet above the boiler, expanded slightly along their interior, creating a vacuum and enhancing draft. Extension fronts were incredibly modern, and the Union Pacific’s design, patented by Congdon, was well in advance of the rest of the industry - the rest of which didn’t catch on until around 1880, at which point it swept the railroad industry by storm. An even more modern and vital fitting was the injector, which allowed engine crews to supply the boiler with water at any time, using steam from the boiler. In the 1860s, water was usually supplied by pumps located next to the crossheads, and worked by their motion. In this way the engine was constantly supplied with water whenever it was running. Crosshead pumps were simple and reliable, and had long proven themselves over several decades’ worth of regular service on every engine in the country. But crosshead pumps were useless on an engine standing still, and when running supplied only cold water from the tender. The injector solved this problem by using a jet of steam to force water into the boiler, which simultaneously heated the water and increased efficiency. Injectors were introduced to the industry in the late 1850s (first patented by Henri Giffard May 8, 1858 in France, July 23, 1858 in Britain, and in the US on April 24, 1860), and the Pennsylvania Railroad adopted them by 1862. Early injectors were used as accessories to crosshead pumps, yet even so, traditional engine men were wary of this strange device. They assumed, as William S. Hudson of the Rogers Locomotive & Machine Works did, that it would be used continually, like crosshead pumps, and would drain the boiler of steam as a result. In practice, injectors were used only when needed. The Union Pacific’s Congdon recognized the use of the injector early on, and by mid 1867 several Rogers locomotives were equipped with small Sellers No. 4 injectors. But Congdon soon started specifying much larger No. 8 injectors, and by early 1868 Hudson grew wary. “We do not see the necessity of having an injector on them as large as your specification calls for, viz: No. 8,” he wrote. "Either of the pumps will more than supply the boiler and a small injector say No. 4 such as we put on the other engines will fill the boiler”at a perfectly reasonable rate. Hudson recommended the smaller No. 4, but attempted to bargain by saying that if the UP really wanted something more, a medium size No. 6 or No. 7 would do. Congdon stuck to his guns and the powerful No. 8 injector was installed on the UP engines, including the famous No. 119. To make sure crews understood how the injector worked, Congdon specified that the drawing and instructions fo the injector were to be mounted in a walnut frame on the forward wall of the cab interior, just over the firebox. The driving of the golden spike coincided with yet another innovation of major importance, but one that was yet on the horizon, the development of practical air brakes. With successful experiments with the Westinghouse air brake system in 1869, both the CP and the UP rapidly adopted Westinghouse straight air brakes on passenger trains in 1871, where it mattered. Both roads had serious grades and a vital interest in maintaining control of their trains. Passenger trains were first, but both roads were also among those pioneering the use of air brakes for freight cars. The national standard at that time allowed hand braking freights cars as the norm, but the steep grades of the Sierra, along with similar circumstances on the Union Pacific’s narrow gauge divisions in Colorado, pressed the adoption of something stronger. In early 1883 the CP began to test boxcars equipped with automatic air brakes in the Sierras by simply cutting them loose onto the main line. There was blood in those days, and it worked. By 1888 all the freight and passenger cars were equipped with automatic air brakes.